I LOVE this book! It is SO sweet! 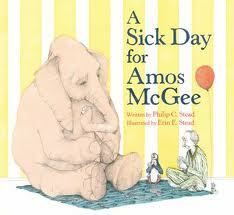 Amos McGee works at the zoo. He is never late and he has a routine with the animals that he never misses. He plays chess with the elephant, he runs races with the tortoise, he reads books with owl and so on. When, one day, he doesn’t show up, the animals aren’t quite sure what to do with themselves, so they hop on the city bus and go to visit Amos who is sick in bed. The animals take care of him and reciprocate all of the niceness that he shows to them each day. This book will leave you smiling, or at least it did me. 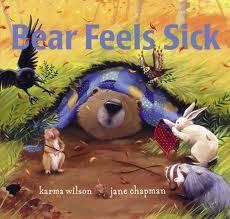 I love Karma Wilson and I especially love all of her Bear stories. This one is no exception. 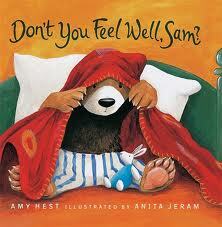 Bear is not feeling well, so his friends do everything they can to help him feel better. They get him some herbs, they make some tea, they sing him lullabies…and it works. Bear wakes from his nap feeling great, but then his friends start not feeling well and it’s Bear’s turn to help out his friends. Sam has a cough so his mom runs down the stairs to get him some cough syrup, but the spoon is too big and won’t go in his mouth (or maybe it just tastes yucky). Either way, the promise of snow coming soon coaxes Sam out of bed. He and his mom enjoy some nice warm tea with honey and wait for the snow. I love the illustrations in this book…have your little one look for the mice on each page.